Puzzling questions ranging from Sildenafil Citrate to I Feel Like A Woman. The Picture Round is match the One Hit Wonder artists to their pictures and the Wild Card is a mad mileage statistic about the London Underground. Q06. What do we more commonly call the oral drug Sildenafil Citrate? Q13. From This Moment On, That Don’t Impress Me Much and Man! I Feel Like A Woman were all late 90s top ten UK hits for which (Canadian) singer? Q28. In which sport might you hear the terms, hinder, hop serve or crotch ball? Q33. The animated comedy TV series South Park is set in which American State? Here’s a low-res sample of the One Hit Wonders Picture Round, click for a higher resolution version. 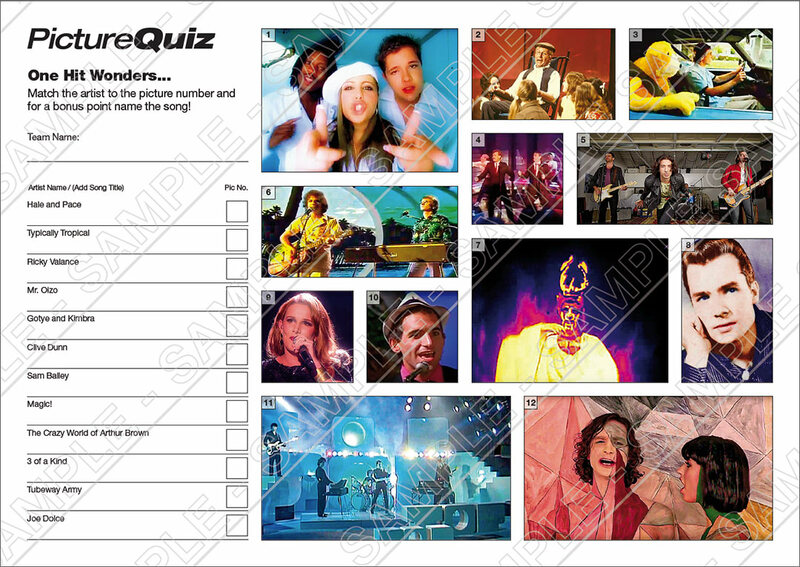 The Picture Round download is a three page high quality PDF. Page 1 is match the Artist Name to the picture number and score a bonus for naming the song, page 2 is just match the Artists Name (no bonus) and page 3 has the answers. This Picture Round with the bonus point went down very well at our regular Quiz. Quiz 055 is match the One Hit Wonder Artists from the last five decades to the Picture Number. There’s an optional printout where a bonus point can be given for naming the song! The Wild Card for Quiz 055 is a mad mileage statistic about the London Underground.